Trams are unable to run between Bury and Manchester Victoria this morning after problems with the overhead lines. Metrolink says engineers are working to repair the damage, but it's "unlikely" to be fixed before noon today. Replacement bus services are running. I apologise to our customers who are having to use alternative transport to make their journeys this morning. I understand that this is inconvenient and frustrating. Investigations have begun to find out the cause of the damage to the overhead lines but our immediate priority is to restore a full service on the Bury line as soon as possible. Services on all other Metrolink lines are running as normal. A woman has been sentenced to five years in prison for pushing a man in front of a tram at Manchester Victoria Railway Station. British Transport Police have released a CCTV image of a man they would like to speak to after two men were randomly assaulted. 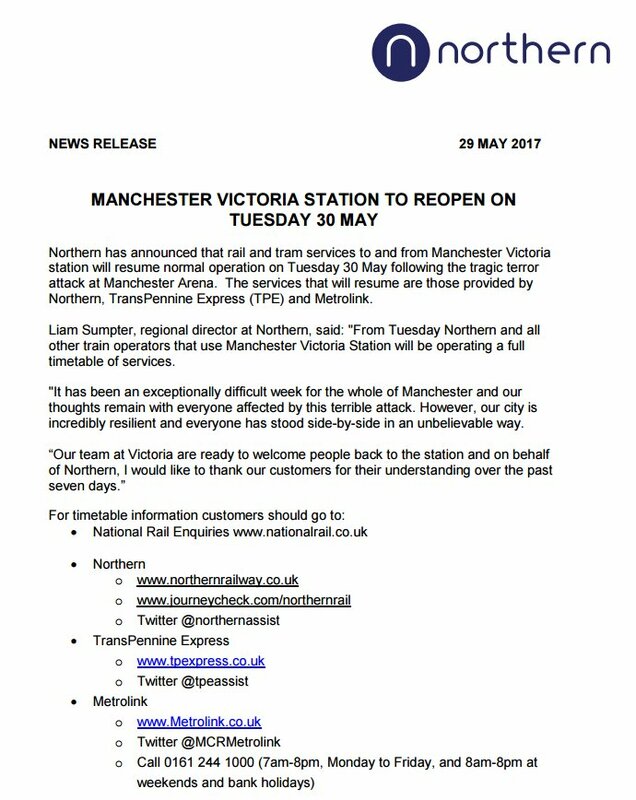 Northern Rail have announced that Manchester Victoria station is to reopen Tuesday 30th May. Both rail and tram services will return to normal operation following the terror attack last week. The station is connected to the arena where the blast happened killing 22 people. Northern Rail thanked customers for their understanding in the past week. Hungry seagulls tempted by McDonalds caused damage to Manchester Victoria station's roof that injured two passengers. Manchester's Victoria train station will officially reopen today after a £44 revamp.